Fresh from Amazon Prime... I was counting down the days for this one. She describes it this way: "When we live trying to measure up on our own, one of two things happens: we strive or we numb out. Or we combine the two, and eventually we numb out because we get tired of striving...Numbing and striving are two indicators that we are trying to find our worth in something other than Jesus." I've done both. Perhaps you have too. Both camps are attempts to escape feeling tired, overwhelmed and like not-enough. I only sticky noted the really good pages. But, there is good news. There's an alternative and it beats both. Throughout the pages of this book, Jennie will teach you how to wave the white flag (embrace your not-enoughness and neediness) and remind you of why you can (because of Jesus' all sufficiency). She will remind you of the singular goal to know and love Jesus because the rest can be overwhelming and He will take care of it. Much of my favorite book (the Bible) is woven throughout this book. Stories based on the Gospel of John are written from the refreshing perspective of the person Jesus encountered. I've always been drawn to the story of Peter and his perspective based on John 21 in this book was no exception. Peter always seemed to say too much, jump in too quickly, and promise big and deliver small. He was bold yet brash. He also failed quite miserably. And not once or twice, but three times. And then, God used him mightily. "It was as if he was saying, “you, the most sinful one, you go build My church. Because I know now you go with great humility you go with a fresh understanding that there is a loving God and you are not Him. You go wearing the grace you will give away. I didn't know how He could ever want me to display Him, but I was in. It was after Peter’s darkest moment that he had the greatest impact. Jesus comes near to Peter in his brokenness. He shows His power once again through Peter’s inadequacy… He wants us to be with Him and then give away what we have been given from being WITH Him. When you connect with God like that, He gets really contagious to everyone else." 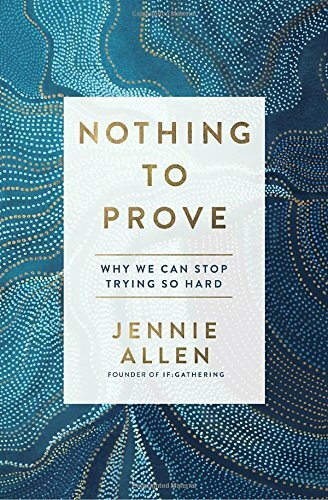 If you find yourself tired, overwhelmed, or feeling like not-enough no matter how hard you try and how much you do, this book is the exhale your soul needs. Like Peter, you'll experience Jesus come near to you in your brokenness and show His power through your inadequacy. Grab a cup of coffee and this book, and wave the white flag because you truly have nothing to prove. I'd rather be watching Netflix than be with Jesus too if I lived afraid of failing Jesus all the time. I don’t want to set my eyes on impact; I want to set my eyes on Jesus and knowing Him more. I read in the book of Acts about the disciples after the Holy Spirit has filled them, and I want what they have. And then I realize I have what they had. You don’t feel like you measure up? Then you are exactly who God is looking for. We were made for wonder but we settle for entertainment. Eternity is going to be shifted. Because finally, a little army decided nothing on earth would hold them back. *Nobody gave me a free copy of this book in exchange for my opinion.